We hung a garland of Monarch butterflies over Graham's crib and he loves them. Their glowing orange wings are a-flutter over sweet baby dreams. The nursery has evolved into Graham's room for the most part, where he sleeps at night and during his naps. Margaret is still sleeping in the crib upstairs. We're never really in here otherwise, except to change diapers on the changing table and to get clothes from the armoire. All of their toys are in the living room because it's more centrally located and also much bigger to explore - and they are exploring. Both are now walking and it is absolutely adorable. They are keeping me on my toes! Love the Monarch garland. Great idea for Graham's room. 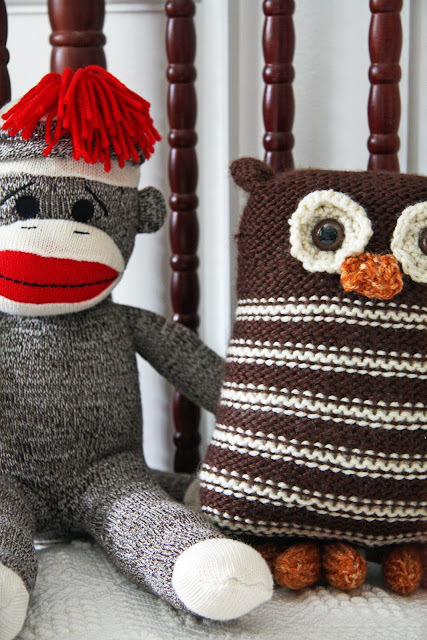 Seeing the stuffed monkey and owl and making sounds with the little ones made me smile . . . and remember. Way too cute. I've never seen anything as adorable as that. At Christmas ca. 1981 Neiman-Marcus in Houston, TX had millions of your butterflies for their theme. 3 story open atrium, dazzling. We rode the excalators just to be amongst them. And we still talk about them. Who says art isn't potent? Thank you for sharing your butterflies. And the wonderful lite coming into Grahams room. Such a cute post!!! I love it! You are all so blessed!!! Beautiful & peaceful. My children still do not use there room and we don't much either. I love it when the whole family is in one room. Gorgeous !! And amazing photography. Love Monarch butterflies, we have them flying around in our garden, keep telling my cat off for chasing them ! I hope I don't come off as the bossy, know-it-all type, but I noticed the beautiful owl has the hard plastic eyes. Sometimes children can chew those off and choke. I have read your blog for a long time and know you to be well informed, so I am sure you were likely already aware of that, but I felt compelled to mention it anyway. Children are so precious. I have read your blog for a long time now and absolutely love it. Your home is filled with style and grace which, I am sure, reflects the personality of your family. I love those butterflies Trina! We are having a butterfly/spring birthday party for our daughter so I am consumed with them at the moment. The butterflies are enchanting. I'd love to have those flying above my own bed! Love the butterfly garland. Did you make that? If not where did you get it from. My grandsons room in our home is all very neutral in color. Those butterflies would just pop. I looked on the box but there is not one printed word on it so I don't know who makes them. I'm sorry I don't have that resource for you! We need a picture of the babies walking! Great pictures - I love the garland! Wonderful, I love it, such beauty and it is peaceful too. Truly nothing more majestic than a butterfly... their beauty and grace! What a wonderful item to hang over a crib. Lovely. I love the nursery! And the owl is adorable! Was that handknitted or did you purchase it? I know a little granddaughter who would love one! The owl came from Etsy -here's the link! I have loved the nursery since you first shared it with us. Just lovely. The addition of the butterflies just makes it that much better. We live in an old farmhouse in the mountains of western NC and the Monarch butterfly eastern flyway runs along the Appalachians. In the fall, millions of monarchs bound for their wintering grounds in Mexico pass through here. 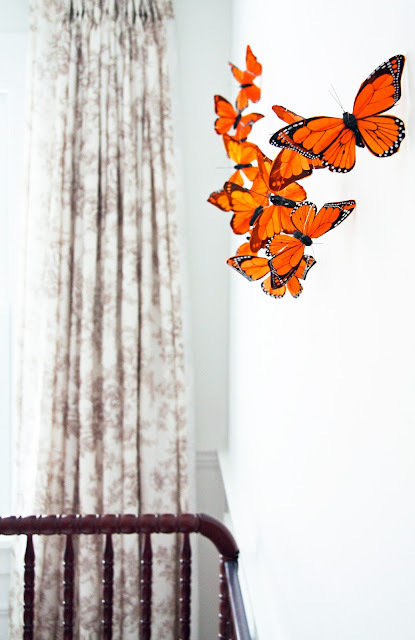 The butterfly garland is a lovely addition to the nursery! Your darling toddlers will be thrilled to discover butterflies in your garden this summer! Awe- such a sweet, love~filled room. Enjoy the weekend. A lovely room! Your babies are growing quickly! I think I can honestly say I love everything about this nursery! So simple and beautiful! We are decorating the little ladies nursery and I feel so inspired by yours! Oh, I am still on these butterflies. I have found what I think you have on Amazon's site. One has 8 butterflies the other has 9 and the price is double for the 9. Not a big deal but can you tell me if they are attached with fish wire? Thats what it looks like on their site but they really don't give much info. I am so consumed with them. 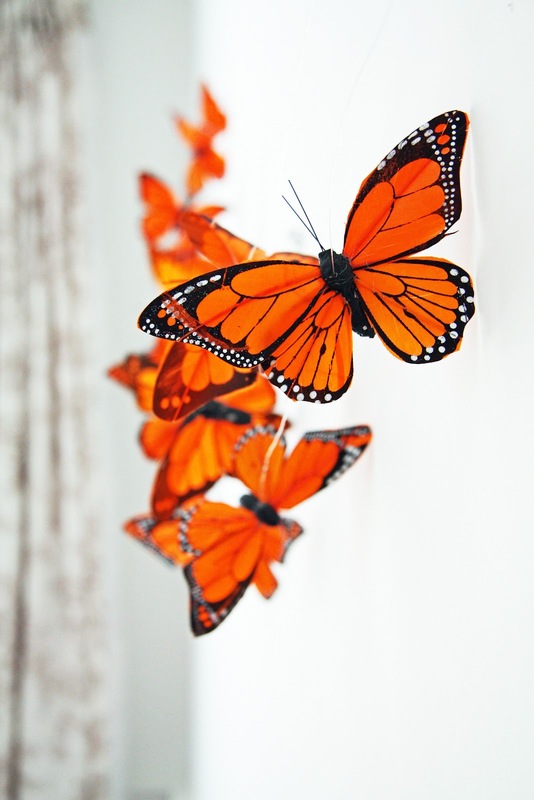 Couple party stores have butterfly garland but in mixed color. I love the orange. Mine came on fishing twine yes. And the garland I hung is actually two garlands as I wanted there to be lots of sweet butterflies for Graham to look at. Thank you so much Trina. What I found on Amazon is most likely what you have. Or as close as it will get. Thanks for sharing. I'm ordering them today and cannot wait for my Liam to see them. Love this post! the nursery is gorgeous, very soothing, just perfect for little baba's! We love butterflies in our house too and go looking for them and buzzy bees in the garden with my baby - he loves it! My husband calls them 'flutterby's'!